Here at Ridgeway we are all aware that we are surrounded by noise. We however only notice bad noise. Based on existing evidence initial estimates of the cost of noise pollution costs the UK around £7 billion per annum, £3-£5 billion in annoyance cost, £2-£3 billion in adverse heath cost and losses of another £2 billion in productivity cost. We have fantastic new acoustic barriers that are available for hire or sale. The Ridgefence Acoustic Barrier 30dB is a top of the range, flexible sound barrier which fits easily to any temporary fencing panel. They are available in the industry standard 2000mm x 12000mm panel. Bespoke sizes and corporate branding available upon request. Our Acoustic Barriers are the most efficient Acoustic Barriers in the market to control noise pollution. In their unique design the barrier absorbs the sound instead of bouncing the sound back to the direction it came from. Sound is simply a pressure wave in air travelling at 344 m/sec. The greater the pressure the greater the perceived loudness. The normal unit used to measure sound pressure levels is the decibel (dB). Ridgefence Acoustic Barriers has the effect of conversion of sound energy to heat energy. This is achieved using open cellular materials, whereby the passage of sound is impeded by friction and the energy is dispersed. Ridgefence Acoustic Barriers have been developed using a composite of fibres that both absorbs and controls noise. When noise is generated on site the barriers membrane will absorb and reduce the degree of noise pollution. 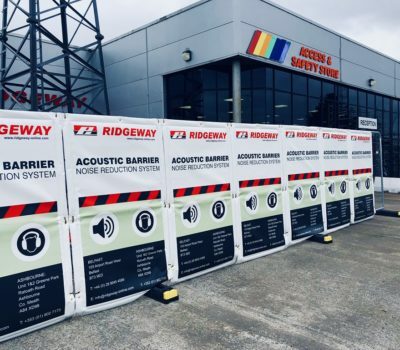 For more information on our Ridgefence Acoustic Barriers please click here.